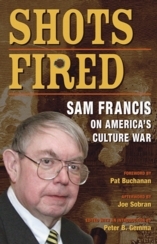 The Washington Post described Sam Francis as “an outspoken voice of American conservatism.” His world view was shaped by an intense dedication to American ideals, an impassioned appreciation for Western civilization, and a mischievous sense of humor. A prolific and prophetic pundit, he condemned “immediate gratification, indulgence, and consumption” and called for a “thunderous defense of moral and decent traditionalism.” SHOTS FIRED is a collection of his unpublished speeches, rare and insightful essays, and incisive commentaries. The inspirational ideas and strategic advice Sam Francis penned will long serve patriots on the frontlines of America’s culture war. SHOTS FIRED to students, libraries, and elsewhere: general donation of any amount.